I don't know if ya'll remember this, but last year in May, Mercury did a retrograde in Taurus. We thought the economy sucked then. This time we know it is a reality! I don"t know if ya"ll remember this, but last year in May, Mercury did a retrograde in Taurus. We thought the economy sucked then. This time we know it is a reality! I expect this Mercury retrograde will actually be much different than the one last year. Last year, many people thought that the economy was just in a slump and would recover soon. This year, we are getting a better picture of the real mess we are in. Taurus is the ruler of money, possessions, beauty, and contentment, when he"s feeling good. When Taurus is out of balance, he can become greedy, possessive, bull headed, and even aggressive. When Mercury is retrograde, we often reexamine the past. Those of us who can maintain our optimism (who see the glass as half-full), may decide to use this time to reexamine our financial game plan and make it work smarter. But, the rest of us who are fed up with struggling and angry at the injustices done to us in the past (and see the glass as half empty) could be overreacting, hoarding, and even cheating others (or maybe organizing a major protest rally). Mercury is the ruler of the mind, communication, neighbors, and short trips, so we may find ourselves reminiscing about the "good old days." And, some may just be deceiving themselves. There may be some property disputes with neighbors (or neighboring countries), and there is a good chance neighborhood thefts will increase (so lock up your barbecue grill). My recommendation as to the best way to get through this Mercury retrograde is first and foremost, do not panic! Do not make any sudden decisions, and postpone any life changing decisions until after mid May. And remember... "Fences make good neighbors." There are also always positives with any Mercury retrograde. In general it is a great time for ghost hunting. The veil between us and the other side becomes very thin. Also ex lovers often reunite during Mercury retrograde. If there is someone from your past you have been thinking of contacting, this is the time to do it. Me personally, I like to use the time during Mercury"s retrograde to go back and look over present projects and see if there is any place for improvements. Okay, now for the nitty gritty astrology. 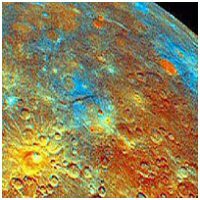 Mercury"s retrograde will travel from 12 degrees 37 minutes to 2 degrees 40 minutes Taurus. Time to look at your natal chart. If you have any power points (ascendant, nadir, descendant, and mid-heaven) between 1 degree and 11 degrees Taurus, watch out! There may be some unexpected changes to deal with. If Mercury is conjunct any of your planets (inner planets carry more weight) during its retrograde, you may find yourself dealing with some issues from the past in the area that the planet governs. Also, look what house or houses Mercury will be covering in your natal chart. You may find that those areas of your life will slow down a bit. This Mercury may be a bit of a challenge, but if we keep our heads and think before we act, we may actually come through it with a few benefits.